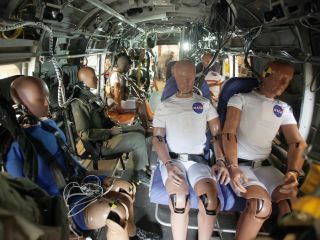 The dummies will test seatbelts and other technologies during a crash test in which the helicopter will be dropped from a height of about 30 feet. These dummies are about to go on a wild ride. On Wednesday (Aug. 28), NASA researchers will load them into the body of a former Marine helicopter and crash it. The chopper will be hoisted by cables about 30 feet into the air and then pendulum-swung into a bed of soil, slamming into the ground at about 30 mph (48 km/h). These conditions will mimic a real-world, survivable impact scenario, according to NASA. The 13 crash test dummies onboard will include a side-facing dummy and one that is lying down like a person on a medical stretcher. Cameras inside and outside of the vehicle will track how the dummies move before, during and after the crash, lead test engineer Martin Annett said in a statement. More than 350 channels of data will be recorded inside the aircraft, Annett said. The monitoring devices include a motion detector that's used in video games to track gestures, faces and voices. "We installed an Xbox Kinect inside the helicopter," test engineer Justin Littell said in a statement. "We want to see if it can be used as an additional instrument to track dummies' movements." NASA's Langley Research Center engineers are scheduled to crash test a former Marine helicopter at the historic Landing and Impact Research facility. The fuselage is painted in black polka dots as part of a high speed photographic technique. One side of the helicopter, a former CH-46 Sea Knight, has been painted white with black polka dots, though not for aesthetic reasons. Each dot is a data point that will be tracked by cameras taking 500 images per second from the ground. Using that data, researchers can reconstruct the crash and see just how the chopper bends and breaks when it wrecks. The results of the tests will be used to improve rotorcraft performance and efficiency. NASA says the overall goal of the research is to make helicopters quicker, quieter, safer, greener and capable of carrying more passengers and cargo. This article was provided by LiveScience, a sister site of SPACE.com. Follow LiveScience @livescience, Facebook & Google+. Original article on LiveScience.